To further reduce socialized health care cost, the British Medical Association has given their stamp of approval to a UK Supreme Court decision that ruled doctors may, at their discretion, withhold food and water from people with diseases such as Parkinson’s or dementia, even if their death is not imminent. now decided to allow doctors to murder those patients who raise the cost of health care. Of course this is nothing new. The right to withhold treatment from patients deemed vegetative began in 1993 as health care costs began to soar, when the House of Lords agreed that it did not constitute murder. Imagine, deliberately withholding food and water is not murder but a health care choice! Sounds a lot like abortion doesn’t it? Let’s repeat that. Now, they are not only talking about patients near death or in vegetative state, but “the much larger group of patients who have multiple co-morbidities, frailty or degenerative neurological conditions.” The UK socialist health care system states that “due to the degenerative nature of their condition, these patients are on an expected downward trajectory and will inevitably die, usually as a result of their underlying condition, although perhaps not imminently and could, potentially, go on living for many years.” Aren’t we all on that downward trajectory? About 850,000 people with dementia live in Great Britain, according to the Catholic Herald. There could be as many as 1 million with dementia by 2025. That’s not even counting those with other diseases. This new ruling by the UK Supreme Court is a death sentence for these people. Worldwide, around 50 million people have dementia, with nearly 60% living in low and middle-income countries. Every year, there are nearly 10 million new cases. The estimated proportion of the general population aged 60 and over with dementia at a given time is between 5 to 8 per 100 people. The worldwide total number of people with dementia is projected to reach 82 million in 2030 and 152 million by 2050. There are currently 19.1 million Americans providing unpaid care for family members which is expected to continue to rise. By 2050 the estimated cost to care for these people could rise as high as $1.1 trillion. The current UK’s motive (and the future U.S. motive) for allowing doctors to decide who is to live or die is the crushing costs posed by caring for the infirm, the old, or anyone deemed unproductive. 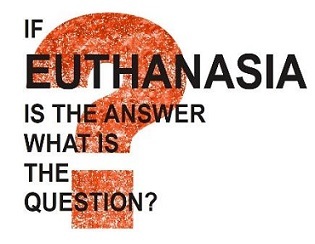 Soon euthanasia could be a fact of life across once-Christian nations. The Walls Are Closing in for the Sick, the Weak, the Old – The conditions are falling into place, one by one: The boundary pushing “success” of global eugenic laws – The normalizing of murder of those that constitute a cost to society – the aging of the populations in nations with vanished birthrates, mostly due to abortion. These factors could soon combine to hand over to those who ration health care the power of life and death. People will see it as the only alternative to their governments going bankrupt. The Reich’s medical program from 1939 to 1941 “mercifully murdered” over 70,000 in Germany and Austria, and Poland before expanding and accelerating. Similar programs were in place in Bolshevik Russia. It is important to appreciate the economic considerations that drove these governments to kill the sick. Soon the pressure will be almost irresistible to implement euthanasia not just on the ill but on all seniors, the disabled, and handicapped, and perhaps those society will no longer tolerate. When it is our turn, we will be told that these tough decisions are being driven by compassion and mercy – never mind that those with the right affiliations or pedigree will be exempt from the state’s mercy.